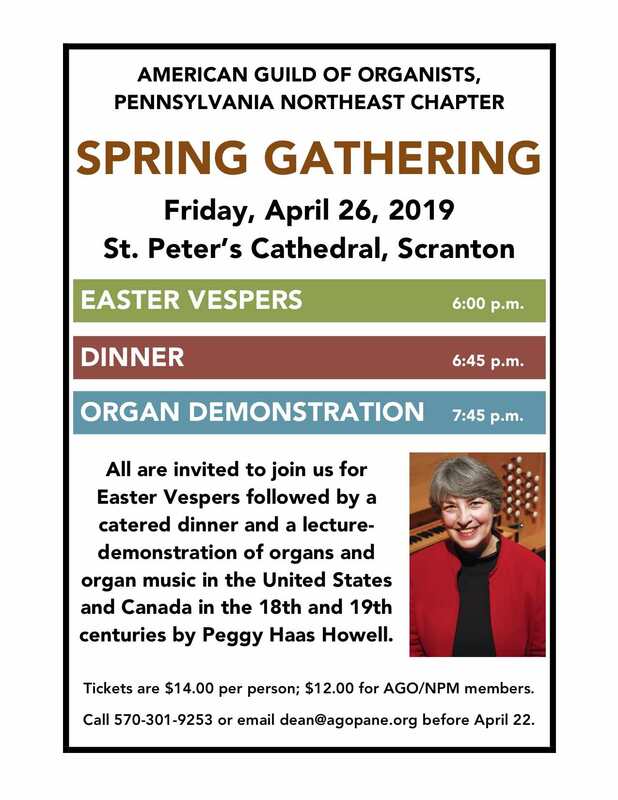 The public is invited to attend our chapter’s upcoming Spring Gathering at St. Peter’s Cathedral, Scranton, on Friday, April 26, 2019 at 6:00 p.m. The evening will begin with Easter Vespers in the Cathedral. After dinner, Peggy Haas Howell will present a fascinating lecture-demonstration of organs and organ music in the United States and Canada in the 18th and 19th centuries. Peggy is Organist and Choirmaster at St. John’s Episcopal Church, Lynchburg, VA, and is the Music Director of Cantate Children’s and Youth Choir. She has been a member of the American Guild of Organists since the age of sixteen, and is currently Dean of the Lynchburg Chapter. Tickets are $14.00 per person for non-members and $12.00 for AGO members. Please RSVP before April 22, 2019 by calling Raphael Micca, Dean, at 570-301-9253 or email dean@agopane.org.